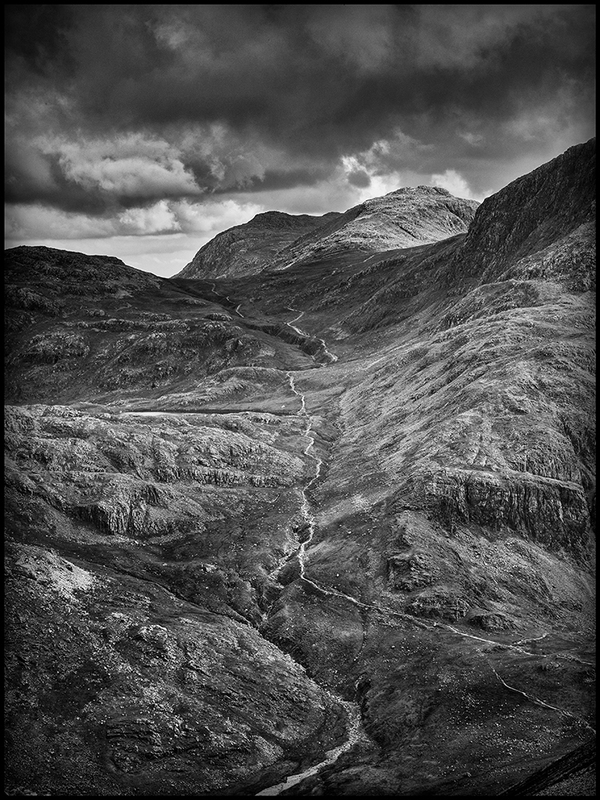 This week’s image is one I took recently in the Lake District (my favourite place in the world). I was near to the summit of Great Gable when I shot this. I had just descended Green Gable and was climbing back up and noticed this great path leading up the hills to my right. I couldn’t swear to it but I think it’s a route up Great End. I should probably look it up on a map. Wonderful image! That little road makes it! Thanks. The path is great. Last time I think I came down that path it was knee deep in snow. I must try to dig out some of the images. You’re welcome…it’d be nice to see the comparison. I will post a comparison shot and some processing details as its a bit of a jump from the raw file to the finished image. It will be next week now as I’m taking a bit of me time this week. Great image Robin. You have a good weekend also. great shot – what would it be like in colour? It’s not good at all in colour. There is a lot of uv and haze with poor contrast. To make the conversion work I had to pump up saturation and contrast. I like the image very much Robin black and white suits it. Have a good weekend. Hope that you enjoyed your ‘you’ time. For me, this image goes straight into the top 5 of the ‘best’ photos that you’ve posted. Which of your many cameras did you use, please? It would also help those of us who are still wearing ‘L’ plates if you could include lens and exposure details. Aperture and M4/3 doesn’t come easy. No problem and thanks for the positive feedback about the image. I will be producing a more informative post about this shot in the near future and will include camera settings.